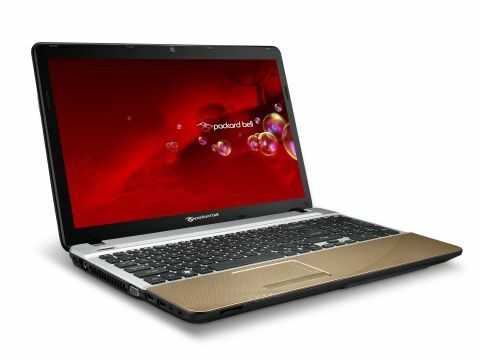 Packard Bell has been busy refreshing its laptop range. The EasyNote TSX66 is a premium version of its existing TS Series, and an impressive little beast indeed. For a start it packs away one of Intel's second generation Sandy Bridge Intel Core i7 processors, previously seen in Acer's Aspire 5750G. Add in some great features and this is an excellent all-round laptop that should appeal to anyone demanding loads of power and strong usability at a reasonable price. The EasyNote TSX66 aims to provide maximum comfort and convenience, wrapped in a stylish chassis. There's no denying the laptop looks smart, with a wavy design adorning the Honey Bronze lid, helping it stand out on the high street shelves. This design continues inside on the palmrests. It combines well with the metallic finish of the plastic interior, giving the impression that the EasyNote TSX66 is something a little bit special. We were surprised to find the chassis flexed under pressure in spots, however, with the area around the DVD drive proving particularly weak. But the palmrests are solid and the lid tough enough to protect against bumps. Packard Bell has stuck with the isolation-style keyboard for the EasyNote TSX66, and we're big fans as always. It's a comfortable board for prolonged typing sessions, with the keys well spaced and spread out, and you get a separate numeric pad if you love a bit of data entry. The EasyNote TSX66's touchpad is compact but responsive. A separate scroll bar along the right edge allows quick navigation through web pages and documents. At 2.7kg, this laptop can feasibly be lugged around on a regular basis if required. It's surprisingly slim considering its 15.6-inch screen, so at least it slips easily into any normal bag or briefcase.